Prior to the instructor training course, candidates must attend a skills assessment. Principles of practical instruction, lesson planning, teaching styles, use of questioning, preparation and use of visual aids, assessment of students' learning, explanation and presentation of theory subjects, the structure of the scheme, planning progressive teaching sessions, preparation of boats and equipment, teaching methods to Level 2. Prior to the instructor training course, candidates must attend a skills assessment- please contact centre prior to booking. Candidates will hold the RYA's Level 2 powerboat certificate and a valid first aid certificate - click here are a list of acceptable first aid certificates. No candidate under the age of 16 will be accepted for training. 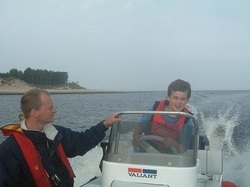 A competent, experienced powerboater who has been trained to teach powerboating up to Level 2 under the supervision of the Principal or Chief Instructor of a recognised centre. To book this course please Contact us first.